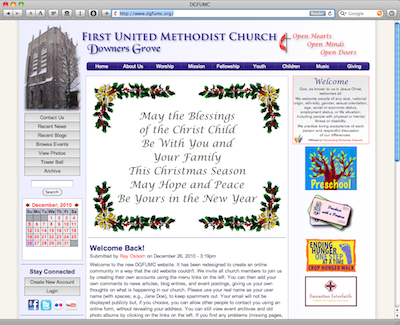 Welcome to the new DGFUMC website. It has been redesigned to create an online community in a way that the old website couldn't. We invite all church members to join us by creating their own accounts using the menu links on the left. You can then add your own comments to news articles, blog entries, and event postings, giving us your own thoughts on what is happening in our church. Please use your real name as your user name (with spaces; e.g., Jane Doe), to keep spammers out. Your email will not be displayed publicly but, if you choose, you can allow other people to contact you using an online form, without revealing your address. You can still view event archives and old photo albums by clicking on the links on the left. If you find any problems (missing pages, confusing links, inaccurate content) or have any other comments about how to improve the website, please let us know. Please join in and stay connected as we enter our 175th anniversary year. Wishing you a blessed Christmas season and God's peace in the New Year. There is a flower board in the narthex.Each month has a sign-up sheet for both sides of the altar. You can purchase flowers in memory of, or in honor of someone. The cost is $20 for a flower arrangement, $27 for a dozen roses, or $11.00 for a single rose. Please sign your name, phone number and what you would like written in the bulletin. One line represents one side of the altar. If you have any questions, please contact the Church Office. We know that this is the time of year when everyorganization is asking for donations. Well the DGFUMC college scholarship fund is doing the same thing. What is the scholarship fund and who is helped by it? Three separate funds were started over 20 years ago and those gifts have now been used up, however we continue to want to help college students. In August, we present small gifts to 4 students who have been active in ministries of DGFUMC. If each family would give $5 in honor of each of their children now and $5 on that child’s birthday, we would have thousands of dollars to give out each year. Please consider giving to this fund. It may be difficult to start thinking about Lent when Advent hasn’t yet begun, but the Adult Education Work Area is thinking about it. We are preparing a Lenten devotional for the congregation to use during Lent. We are seeking submissions from the congregation for this “Upper Room”-style devotional. Please include a prayer and scripture to accompany your meditation. While we don’t seek to limit your meditation, please keep it to 400 words or less. We want to hear from a wide variety of people in the congregation. Ask God to guide your thinking and let the Spirit speak through you. This is the last opportunity to submit a devotional. Please contact the Church Office with your submissions. Thanks to all of you who have donated books to the church library in recent months. Many of them have been added to the library collection and the others will be given to the Downers Grove AAUW used book sale. Book donations are always welcome, particularly those with a religious theme. All church members are encouraged to use the library and check out anything of interest. Please don't keep the books too long or you'll receive a gentle reminder from the church librarian! Questions? Contact Mary Beth Weeks. Yes, winter is upon us, but the Youth Group and Chapel Choir have Spring Break and even Summer on their minds already. Why? Because of Choir Tour and Mission Trips! Why now? Because we’re trying to figure out how to afford them! How can you help? One easy way is to support our Pampered Chef® Fundraiser for Youth Ministry. Shop online starting now or visit the display tables in the parlor on December 5. Choose from a great selection of gift ideas and helpful tools for your kitchen just in time for Christmas baking and entertaining. To order online, simply visit http://www.pamperedchef.biz/kelleyhook . 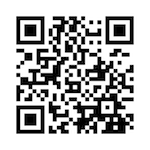 Click SHOP ONLINE, enter FUMC as the Organization under Option #1, and begin shopping. If you have any questions or prefer to order by phone, please call Kelley Hook at 630-852-2433. Orders must be placed by Sunday 12/12 and will be available for pick up at church on Sunday 12/19. Out of town friends and family can order online and have orders shipped directly to them in time for Christmas. This year, skip the mall and do your shopping at home or at church! All proceeds support our Youth program. Thank you for your help! The Downers Grove Patch has a great article about the Interfaith Youth Program that our youth are participating in. The Giving Trees are now in the Parlor. You have the opportunity to choose tags from several agencies in order to purchase gifts for both children and adults. The tags are marked with the name or initials of the agency. Please select tags and put your name on the sign-out sheet. Please read the note on the tag to see which kind you have chosen. All gifts for Marcy Newberry and Head Start should be wrapped. Child Serv gifts should be unwrapped. Please don’t wrap gifts marked “unwrapped” or volunteers will have to unwrap them before giving them to the agency. The gifts for all the agencies other than PADS should be returned with the tags firmly attached no later than noon on Sunday, December 5. Gifts for PADS will continue to be collected into December. The Children and Family Ministries Work Area and the Church and Society Work Area sponsor the Giving Tree project. Over 300 gifts go to needy children, youth, and adults in our township and across the Northern Illinois Conference. We hope that you will be able to help. Much more info after the first of the year!! !